Pascal Payot: A true nature man has passed away. He was not just talking about mountain nature, he was living it. I have met him in a number of situations where he impressed me by his, often non orthodox vision, but making a lot of impact, because his genuine experience. He was a renowned figure of the Chamonix Valley and he will be deeply missed. A close friend of him, Eric Lasserre has written (in French) the following tribute which I have attempted to translate. Carried away by a ruthless disease that has left him no respite for eight months, and which gave him a lot of suffering. I lost a dear friend, we all lose an exceptional person who has left a strong imprint in the (Chamonix) valley. Former gamekeeper, mid mountain guide, advisor for alpine fauna to the Prefect, municipal Councilor with many relevant interventions, from 2008 to 2014 on Eric Lasserre’s alternative list, he has devoted his life to agro-pastoralism. The forest was his secret garden, the source of his tremendous wildlife knowledge. A really powerful man, with his own hands he cleared-up the Blaitière pasture invaded by reforestation. He gave a new life to the high meadows, by reintroducing heifers, then his goats. Paying a visit to his sheep fold where his smile and cheeky humor was greeting you at any time was a great experience for hikers. 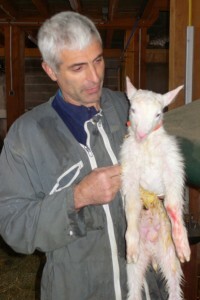 (Down in the valley) At his farm in Les Houches, he welcomed with kindness and good humor all visitors interested in learning the science of modern breeding goats. A tireless storyteller, he breathed his passion. He knew how to captivate children by telling a thousand of fascinating anecdotes about life in the mountains, around a succulent snack. The little ones were literally drinking his words. His integrity was legendary, his humor was corrosive, his empathy was open to all. He was not a good business man though, as he was too generous, and never made a fortune selling his sublime cheeses. He was more giving than he was selling. In 2013 he saw his business collapse under the repeated pressure of private interests, driven by jealousy or malice, denying access to his valley pastures. Consequently, heart broken, he had to terminate his activities and sell his farm. It is in the immediate aftermath of this personal disaster that he developed his disease, none will prevent me from thinking that the ordeal he went through prepared the bed of the malignancy. Keep in memory his smile and his strength.